From leaks of NSA surveillance programs to the IRS and Benghazi controversies, Washington has been rife with revelations and high-profile investigations this year. But the public paid more attention to the debate over gun policy than any of those stories. In late January, 43% said they followed President Obama’s gun proposals very closely and 39% tracked the gun control debate very closely in April, the week that the Senate defeated gun legislation. No other Washington story has drawn more interest this year, according to our polls. 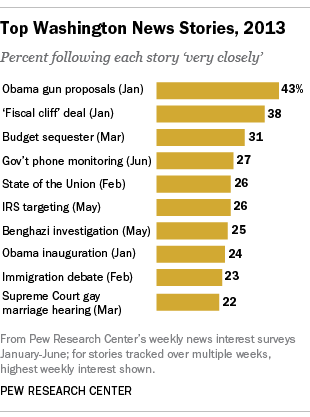 In early January, 38% followed news about the “fiscal cliff” agreement very closely. By comparison, there has been less interest in news about the NSA phone and internet surveillance, the IRS’s scrutiny of conservative groups and the congressional investigation into last fall’s deadly attack on the U.S. consulate in Benghazi, Libya. Last week, 27% paid very close attention to news that the government had collected phone records from Verizon for national security purposes (although, this story is still developing so interest may increase). In May, 26% followed news about the IRS very closely while about as many (25%) said they were following news about the Benghazi investigation very closely. Notably, interest in the gun debate has far surpassed interest in the immigration policy debate. So far this year, only about one-in-five have followed the debate over immigration policy very closely (23% in February and April). However, with the Senate debate over immigration legislation continuing, interest in the immigration debate also may grow, so stay tuned. Overall, the top story of 2013 – by far – has been the Boston Marathon bombings, which killed three and injured dozens. Fully 63% followed news of the terrorist attack very closely in mid-April, among the highest for any story over the past decade.